Double-dipping on recyclable items is big, crooked business in California. Recycling is booming business in California -- consumers recycled 17 billion aluminum, plastic, and metal containers, according to the most recent data (from 2009). The state agency that handles California’s recycling program, the Department of Resources, Recycle, and Recovery, says consumers are recycling at a rate of 82 percent, the highest rate in the nation. Agents with the California Department of Justice says with crime has followed this booming industry. “Recycling fraud is really a crime against people of California,” said Mark Oldfield, Communications manager for the recycling agency, known better as CalRecycle. Over the last few weeks, state agents raided homes and businesses across the state, including Corona, San Jose, and Hillsborough. They arrested five people, including Joseph Chen, Jason Huang, Sun Gee, and Wan Ping Zhu. The Attorney General’s office says all were involved in a scheme to double-dip, essentially recycling material that had already been recycled. During their raids, agents said they confiscated $69,999 in cash, suspected gold bars, and bank account freeze orders for $8 million. In an email to NBC Bay Area, Agent Michelle Gregory said some of the suspects broke down huge bales of recycled cans to get more cash for them. And the suspects are accused of shipping recyclables from out of state. That’s illegal because that material does not have a California redemption value. “If someone takes money out of (the California Redemption Value Fund) by bringing in containers from another state when no deposit was even paid, by running the containers through the system more than once, it’s stealing money from a fund that belongs to the people of California,” said Oldfield. Oldfield says the CRV money is used not only not pay customers for their recyclables, but also for recycling and other environmental programs across the state, including the California Conservation Corps. “Joseph Chen is not guilty,” said Steve Manchester, the San Jose attorney for Joseph Chen, once of the suspects. Manchester said Chen simply ran a company called Tung Tai, a scrap metal dealership. Manchester said his client is not responsible for whatever customers at Tung Tai did with the recycled material after it left his business. At Tomra Pacific Recycling on Story Road in San Jose, the manager said he recognized one of the suspects, Wan Ping Zhu. “She came in twice a week in a white van last year,” said manager Edward Tan. Tan said he was later told not to buy material form Zhu anymore, because it was illegal. There was no answer on a phone registered to a Wan Ping Zhu in Daly City. Efforts to reach the other suspects were also unsuccessful. 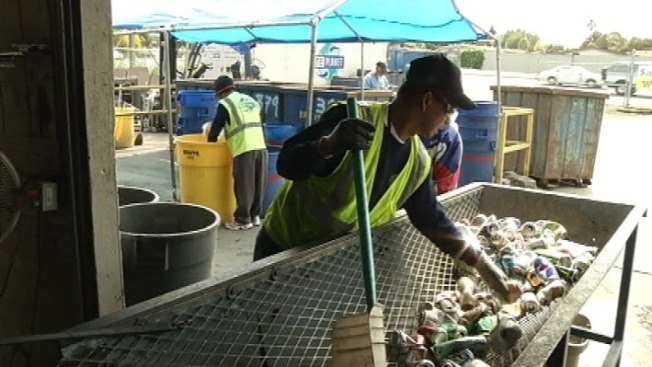 CalRecycle said it will continue to monitor recycling fraud, so California can keep its money.